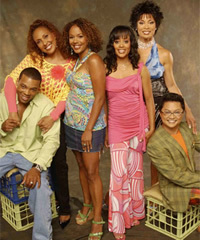 This sitcom follows two half-sisters, Mona (Rachel True) and Dee Dee Thorne (Essence Atkins), who grew up separately and in very different homes. Years ago, outspoken Phyliss (Telma Hopkins) had divorced Charles Thorne (Obba Babatunde) when their daughter Mona was a small child. Wealthy Charles then married self-absorbed Big Dee Dee (Valarie Pettiford) and together, they had Dee Dee. While Dee Dee grew up spoiled in a two-parent home, Mona was raised to be a practical woman by her single mother. Mona supports herself as a self-reliant music industry executive while perky Dee Dee is a law student and social butterfly. Charles desperately wants to forge a relationship with Mona so he promises her the penthouse in his apartment building. While she’s settling in, Big Dee Dee shows up with her daughter and wants the penthouse for her little girl. To keep the peace, Mona agrees to take another apartment in the building and the two half-sisters begin to get a taste of what it’s like to have a sibling. Why did little Dee Dee treat Mona so bad? I liked the show, but it just seemed that Mona was always treated badly by their dad and her little sister. The writers should have made Mona a little bit more aggressive. Does anyone know where i can stream this show online? Great show. Don’t know if I watched it when it was in production but I always watch it now my days off. I laugh a lot. And it’s not ghetto. I miss this show! Out of all the show I thought half & half would have been the show they pick up but I guess since it’s ot a ghetto fab show it had to get canceled. I liked this show. It was funny!I enjoyed hearing Telma and Valarie sing. Can it be that it wasn’t ghetto? Come on people.If the Game can make a come back in all of it’s ghettoness I’m sure that this wonderful show can make a come back. WHAT IS WRONG WITH YOU!!!!!!!!!! IT WAS NOT RACIST. I totally agree with you Mia. Half & Half is / was not a ” ghetto” show. It was just a show about 2 half- sisters living their lives. If the show is racist in your perspective then, that is how you feel. Everyone feels different about the show. Me, personally wish the show was never canceled. But, what are you going to do about it right? ?